NSI Equipments Pvt. Ltd. has been a charished name in the field of manufacture of Sugar Cane Crusher for Sugar Plant/Jaggery Plant/Mini Sugar Plants across the length and breath of India. NSIE three rolls of a conventional crushers are arrenged in a triangle so that the fiber is squeezed twice between the top roll and the feed roll and the top roll and the discharge roll. The rolls have Cast Iron, grooved shells mounted on steel shafts. Fiber passing between the top and feed roll is carried overe a trash plate to the discharge roll. 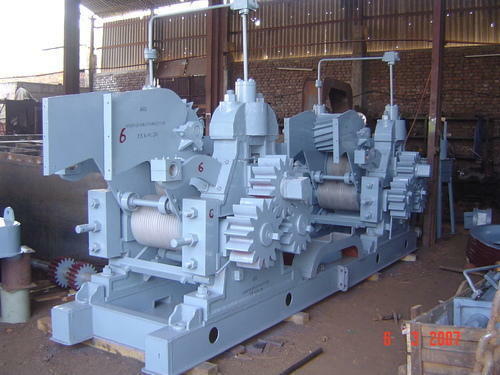 The rolls are pinion driven from the top roll which is driven at a speed of 3 to 6 rpm by agear reduction system. The feed and discharge rolls are fixed, while the top roll is free to move up and down by means of a hydraulic pressure system. Cane is moved between mills by means of intermediate conveyors. They are generally rake or drag-slat type, which carry the fiber to a fixed chute leading to the nex mill. NSI Equipments Pvt. Ltd is a fast emerging company specializing in the Design and manufacture of MINI SUGAR PLANTS AND HYDRAULIC CANE CRUSHERS for the past four decades. Over the years NSIE has consolidated its experience in its field and has developed its expertise. Our endeavor is to supply well engineered product to the specific need of our customers. Customer satisfaction is our paramount importance, which is the foundation to our business policy. We have excellent reputation for the quality of our product range as always endeavoring to advance technology, appropriate fabrication processes at all stages of manufacture. This has been possible with the active participation of our management, staff and workers. We are up-grading the sugar plants and its technology with new sophisticated cutting edge technology and constant innovation in the industry. Our developed and engineered sugar plants cuts remarkably on steam & power usage thus maintaining power house efficiency & steady operation. The plant ensures improved exhaustion leading to the bulk production of uniform quality of sugar. Design of each plant is personalized with a view to provide capacity optimization, high energy efficient boiling and low steam consumption. Design generating software's comprising Autocad, Proengineer, solid works and technical documents are used for project engineering. With civil designs and drawings the engineering also includes plant and site layouts, equipment and sectional general arrangements, detailed equipment specifications and data sheets, steam and power balances, electrification and piping. "To be passive and procative in providing quality product and solutions to clients by continuously striving to exceed their expections"
Our commitement toquality is unflinching. Our desire for growth is deep rooted and our capicity for details is amazing. We adhare to national and international standards across all operations: from sourcing the raw materials & till it transfers to the finished machinery and finally sucessful commissioning. All our suppliers operate quality management standards as dicated by specific markets. This measure undoubtedly reflects our royalty to quality assurance and our determination to provide the products and service to our customers demands. What set us apart are the depth of our commitment and the high level of our concern to deliver quality products, efficient services and total solutions and this is where our quality improvment comes from. At NSIE, quality is away of life. We provide errection and commissioning consultancy support for all the equipment either supplied by us or purchased from outside venders. We supervise the trial running of plant with providing training to personnel involved in running of plant.